Germany’s veteran chancellor Angela Merkel, often called the world’s most powerful woman, will embark on a fourth term with diminished influence and little vision for shaping Europe’s future, analysts say. After wrapping up more than 24 hours of talks Friday between her conservatives and the Social Democrats on forming a new “grand coalition” government, Merkel insisted the preliminary deal would break the deadlock in Germany and pave the way to a “fresh start” for Europe. But before the ink was even dry on the roadmap for her new administration, observers branded Merkel and the team she’s likely to lead a “losers” coalition with little ambition or power to tackle the major challenges facing the country and the continent. “In fact this ‘grand coalition’ is only a mini-coalition with just 53 percent” of seats in parliament following the September election that saw both parties cede millions of voters to the far-right, anti-immigration AfD party, political scientist Karl-Rudolf Korte of Duisburg-Essen University said. This compares with the lavish, nearly 80-percent majority the parties enjoyed during Merkel’s previous term, he told public broadcaster ZDF. Merkel insisted the accord with the Social Democrats, which must still be approved by the party’s rank and file, would ensure Germany’s enduring stability and prosperity. “We will work earnestly, today and during the next term, to create the conditions so that we can also live well in Germany in the next 10 years and 15 years,” she told reporters, flanked by SPD leader Martin Schulz and the head of Bavaria’s Christian Social Union, Horst Seehofer. However, influential news magazine Der Spiegel branded the alliance led by Merkel, who has been in power since 2005, a “paleo-coalition” of political dinosaurs bereft of fresh blood to propel renewal. The deal has also largely left Social Democratic Party voters cold, according to an opinion poll published in Der Spiegel, with just 41.9 percent in favour. Fully 49.7 percent took a “negative or very negative view” of a new tie-up with Merkel’s Christan Democrats. While France’s young president Emmanuel Macron said he was “happy” about progress in ending Germany’s four-month-long political limbo, critics at home savaged the tired-looking troupe. “The losers of the September election have come together again and you have to say that this programme blueprint doesn’t even begin to address the problems in our society,” charged Dietmar Bartsch, a leading figure with the far-left Linke opposition party. Nicola Beer of the pro-business Free Democrats said the deal showed little imagination or “future-oriented pragmatism” and would thus feed disillusionment and support “for the extreme right and left” of the political spectrum. The 28-page joint policy outlines included pledges to join France in a push to “strengthen and reform” the eurozone, to limit the influx of asylum seekers to Germany to around 200,000 a year, and to refrain from tax hikes given the healthy state coffers. But the absence of grand new initiatives led political scientist Werner Patzelt of Dresden’s Technical Institute to conclude that more-of-the-same from Berlin could boost the AfD in particular. “It will hand them success in upcoming state elections and they’ll step up calls for Merkel to resign,” he said, attributing her relative weakness to the record refugee influx in 2015 that undermined her standing with many voters. Although Merkel stunned many observers abroad by winning re-election despite her controversial open-border stance, her struggle to form a viable coalition has revived speculation about the twilight of her reign. 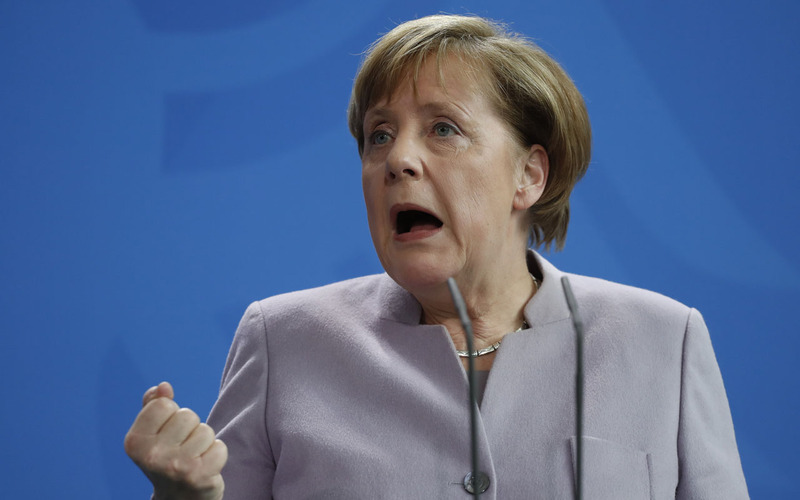 “Angela Merkel is past her zenith,” Oskar Niedermayer of Berlin’s Free University told business daily Handelsblatt. “In the interest of her party’s electoral strength, she should not stay in office for the entire legislative term” running until 2021. A majority of Germans now share this view according to a poll published this week, with 56 percent calling for her to leave the stage before the next scheduled elections.